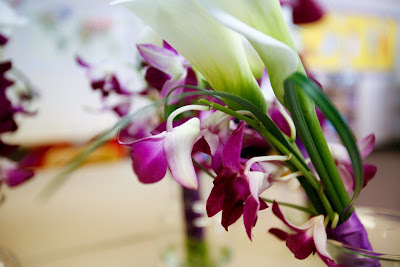 Blog Orchids and Callas to brighten up winter! 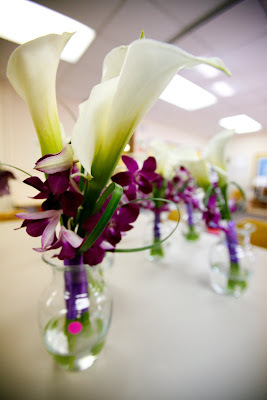 Orchids and Callas to brighten up winter! These are the bouquets from a wedding we did last winter. Even though the season should have meant cold, frigid temps, the bride and groom’s January wedding day was a gorgeous one! Lots of sunshine and no need for coats! 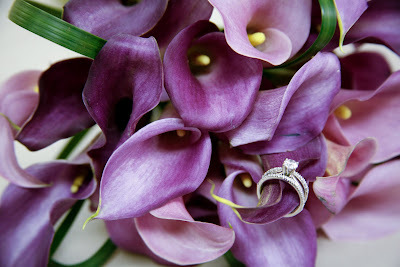 The tropical bouquets of dendrobium orchids and calla lilies really fit right in! 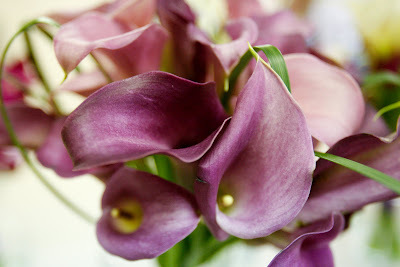 The bridal bouquet was a sleek arrangement of purple mini callas and lily grass loops. The bridemaids carried linear bouquets of large white callas and purple dendrobium orchids, accented by looped and straight lily grass. Bright and beautiful flowers for a bright and beautiful couple! !